BlahBlahCafe :: View topic - new Revolutions + Chronologie / Chronology LP in April ? 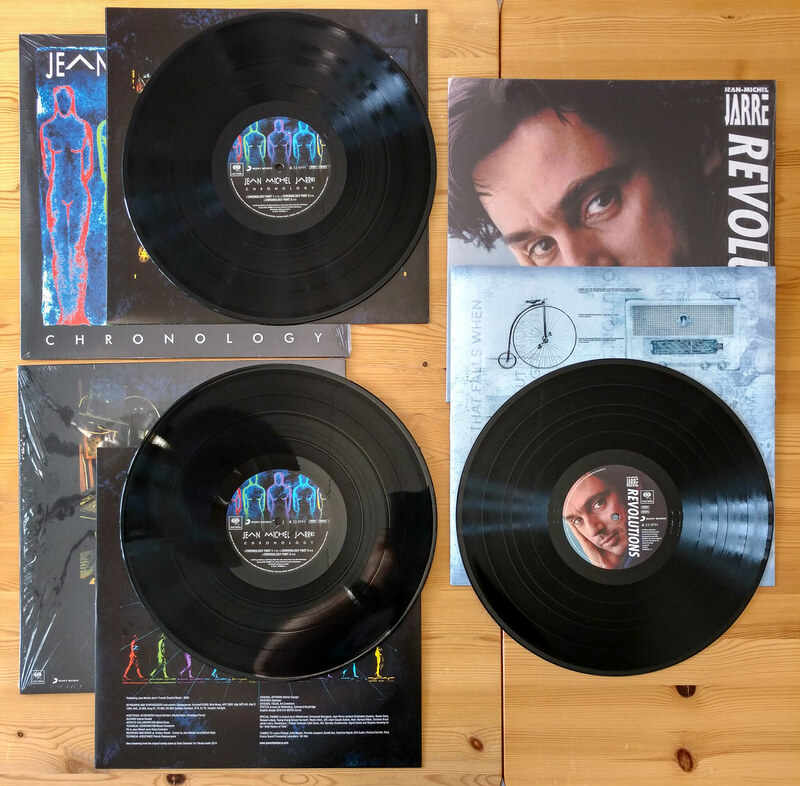 BlahBlahCafe Forum Index » Jean Michel Jarre » Albums & Other Releases » new Revolutions + Chronologie / Chronology LP in April ? new Revolutions + Chronologie / Chronology LP in April ? I'm most interested in hearing how the Revolutions one compares to the "1999 bootleg LP". But yeah, I guess that aside from this release of Chronologie having a nicer inner sleeve than the other editions (to my current recollection), these editions can be skipped. So here they are. CDON's Chronology "limited blue edition" and iMusic.dk's Revolutions "30TH ANNIVERSARY PURPLE 180g". Both the Chronology vinyls are slightly off center but not by far enough to affect the sound. Chronology "black vinyl" has yet to come from Amazon. Damn, guess I called it. Seriously what is going on with this release? I now have the ones from Amazon but today they claim the release date is May 4th and not yet available. Alright, got my copies as well. That has sold me in to buying the Revolution 2018 LP! The last CD copy i bought was the gold border remasters, you can hear the hi-hat on the drums a lot clearer, sounds more lively too. Does the rest of the L.P sound any different? I'd say it's mostly about increased bass and treble with Revolutions. The Chronologie one also has the odd edits (the transition between Chronologie 1.1 and 1.2, Chronologie 8's watch part at the end starting earlier... but also a nice feature in Chronologie pt. 4 fading out later than in the pre-2010s versions). Comparing Chronology 4 and 5 with the 1997 Chronologie CD (Scott Hull remaster) although the more saturated and punchier bass on the vinyl I still think the older CD sounds clearer, crispier and more well defined. The droid effect and solo near the end of Chrono 4 is drowned by everything else and the big string sound on Chrono 5 is a big mess. I can blame it partly on my cartridge and tube pre-amp which are creating a warmer sound and are less successful in emphasizing minor details. Probably also why Chrono 1 and the big organ opening on Chrono 8 is so darn powerful on this new vinyl. Interesting... In a way it's somewhat comforting that it's not only the remaster that's messed up! Exactly, that's one minus point off the Sony/Dadwater record. ... Which still leaves all the other negative points in there, of course. A definite plus point, though: Aside from the text getting cut off, I'd say that visually this 2018 Chronology LP has the best packaging out of all the other Chronologie LP editions. Really sleek and stylish. The Brazilian one still has the best-looking labels on the actual record, though, IMO. I have not seen the new Chronology LP for real yet, but from the pictures posted above it looks really nice indeed. I agree with you on the labels of the original Brazilian LP - the design is consistent with the original CD.